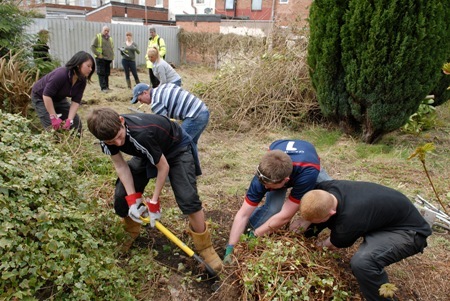 Volunteers have started work to clear an overgrown alley in Ellesmere Port town centre and convert it into an ‘Incredible Edible Alleyway’. Using privately owned gardens in the alley between Trinity Methodist Church and homes on Oldfield Road, the ‘Incredible Edible Alleyway’ project will improve a derelict area of land and grow fruit and vegetables as part of a local community initiative. Led by Trinity Ellesmere Port, the scheme aims to respond to the health and wellbeing needs of local residents and offers opportunities for volunteers with a range of interests. Transformation of the first five gardens of the Incredible Edible Alleyway is expected to be finished by the end of July. Local member, Councillor Justin Madders, said: “Going down to Oldfield Road and seeing the work taking place by volunteers, it’s clear that not only will the ‘Incredible Edible’ scheme revive unused land and provide fresh fruit and vegetables, but it will bring together the local community in a fantastic shared project. “As progress continues on the ground, more and more residents in Oldfield Road are already getting involved and hopefully we will see more people wanting to join in and improve their gardens as well. Permission for the project to go ahead was received from private landlords following research into ownership by University of Chester student David Herson – who is also in the process of setting up a society to manage the gardens once complete. Trinity Ellesmere Port volunteer and Reaseheath College student Mei Chan has been appointed as the project’s volunteer champion – co-ordinating the gardening works and volunteers. Jim Williamson Child and Adolescent Mental Health Service Practitioner from the Primary Care Trust, whose team have been volunteering on the project, said: “For our first day on the project, it has been great success and it was brilliant to see the young people involved getting stuck in and working together. Anyone interested in getting involved in the project can volunteer via Trinity Ellesmere Port or Access2 Training & Employment – a Community Interest Company established in Whitby Road. Please contact rachel.harding@trinityellesmereport.org.uk for more information. Access 2 Training & Employment project manager Gary Williams, Rachel Harding from Trinity Ellesmere Port and Town Centre Improvement Manager Jochem Hollestelle with volunteers creating the Incredible Edible Alleyways fruit and vegetable gardens.